Current Raketa is www.raketa.com and I strongly recommend to visit this site and review their contemporary production, which is in a completely new level. 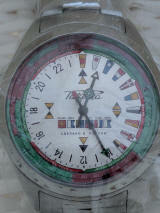 This restoration here is only to help collectors determine what nice watch models was Raketa offering in past years. Read about Raketa's history in our column The Fall and Rise of Raketa. Raketa site was opened at pchz.narod.ru in 2004. This was the first online site of Raketa factory. During the years the site was modified in some extent. I restored two "snapshots" of the main versions of this site – years 2004 and 2008. This restoration is based mainly on information you can get from web.archive.org. Unfortunately many pictures are not collected by web.archive.org and are lost. (You will see it when a popup window opens and the picture is missing.) Some of them I could find from another sources. I made only one significat change in the original menu/navigation system. In version 2004 some main pages from 2006 are added. You can find these pages in the upper right navigation menu, called Special - products 2006 and Special - souvenirs 2006. Here is a list of some picture gallerys and interviews made in Raketa factory and/or Raketa museum. Петродворец, Музей ПЧЗ «Ракета», январь 2010 г. — 01.2010. Жан-Клод Квине, Raketa — 02.2012. Экскурсия на производство часов Ракета (ПЧЗ) — 03.12.2013. В Петродворцовом часовом заводе в День космонавтики откроют музей — 11.04.2014. Музей ПЧЗ (Я – Ракета или как посетил ПЧЗ с визит… с экскурсией.) — 16.04.2014. Открылся музей Петродворцового Часового Завода «Ракета» — 16.05.2014. Петродворцовый часовой завод — 04.04.2016.